Super Tuesday preview for Democrats and Republicans. 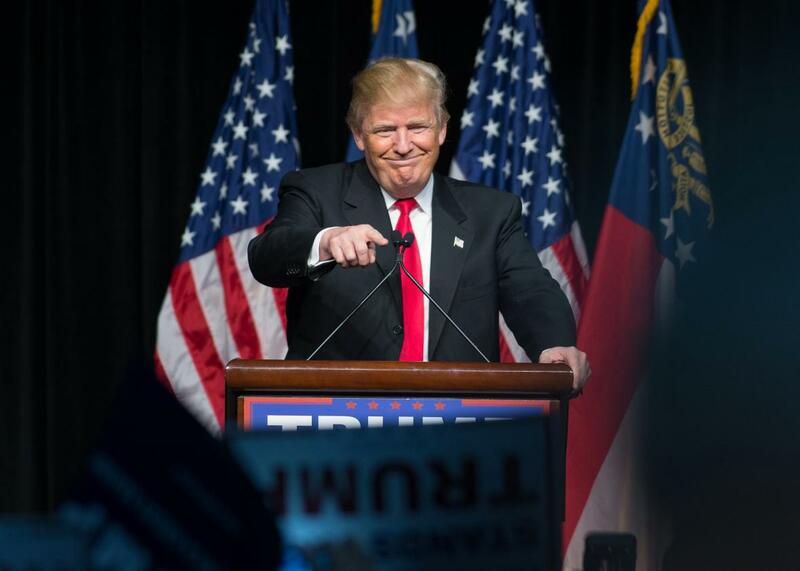 Donald Trump speaks at a rally at the Georgia World Congress Center on Feb. 21 in Atlanta. It’s Super Tuesday! Will Donald Trump sweep through the South? Or will Ted Cruz successfully defend his home state? Can Marco Rubio actually win a primary? Will Hillary Clinton maintain her status as the prohibitive favorite for her party’s nomination? Or can Bernie Sanders regain the momentum that turned him into a legitimate threat after New Hampshire? We’ll find out the answers to those questions and more when the final votes are tallied in two dozen different contests—11 Republican, and 13 Democratic (including American Samoa and the Democrats Abroad primary)—Tuesday night. Here’s what to watch for. There hasn’t been nearly as much polling in the Super Tuesday states as there was in the first four nominating contests of the year. That adds some degree of uncertainty to the first multiprimary date on the calendar, but the numbers we do have suggest more of the same: Trump, Trump, and Trump. The celebrity billionaire has been averaging double-digit leads in Massachusetts (28 points), Alabama (15 points), Virginia (15 points), Vermont (15 points), and Georgia (14 points). He is also the favorite in Oklahoma, where his advantage is smaller though still sizable (7 points), and is expected to be competitive in Alaska, Arkansas, Minnesota, and Tennessee, where reliable polling has been harder to come by. It would be a shock if Trump doesn’t win most of Tuesday’s Republican contests; a near-sweep looks much more likely. Any boost Cruz gets from winning his home state will likely be overshadowed by his losses throughout the South. It’s difficult to see a plausible path to the nomination for the Texan that doesn’t include heavy support from Christian conservatives, who helped him win in Iowa and who also play an outsize role in contests below the Mason-Dixon Line. But Evangelicals aren’t the monolithic voting bloc they’re often portrayed as, and those in the Old South voting on Tuesday could very well break for Trump, as they did in South Carolina 10 days ago. As the Cook Political Report points out, Southern white evangelical Republicans exhibit a higher degree of racial resentment than their brethren outside the region. Given that Trump has swapped racial dog whistles for a bigoted bullhorn, it’s no wonder that the New York real estate tycoon has received such a warm welcome in the South. Cruz, meanwhile, is in danger of going from the conservative Christian candidate who can’t expand his base to one who’s lost it. And what about Rubio? The Republican Party’s favored candidate is desperate to turn the GOP contest into a two-man race, but if he doesn’t get a win soon, he might not be one of those two men. It’s unclear where or even if Rubio thinks he could win Tuesday night, though. The most recent survey out of Minnesota—taken in mid-January—had Rubio with a 2-point lead on Cruz and a 5-point advantage on Trump, but Team Marco has instead focused the vast majority of its financial resources in Southern states like Texas and Virginia, where he’ll compete for delegates but probably not statewide victories. Last month, Rubio’s campaign was touting a 3-2-1 plan that included winning South Carolina. But after going 3-5-5-2 to open the year, he’s been reduced to a nickel-and-dime delegate strategy designed to give him a reason to stick around until Florida, where his team is promising a victory even though it’s been more than a year since a major public poll has shown him with even a narrow lead. Yes, a GOP calendar back-loaded with winner-take-all states offers Rubio a path to the nomination even if he strikes out completely on Tuesday, but he’d have almost no margin of error. There will be a total of 595 GOP delegates up for grabs Tuesday, nearly half of the 1,237 needed to secure the nomination. None of the contests are winner-take-all affairs, which means Trump might emerge with a commanding lead, but not an insurmountable one. If he wins seven or eight states, though, it will start to feel like one, particularly given he’s also the polling leader in Florida and Ohio, which hold all-or-nothing contests in two weeks’ time. Trump isn’t the only 2016 hopeful who can start writing a Super Tuesday victory speech. Clinton has a chance at her own near-sweep Tuesday night, particularly given her dominating performance on Saturday in South Carolina, where she crushed Sanders by nearly 50 points—and, more importantly, by a 6-to-1 margin among black voters. If she can repeat that margin among nonwhite voters—or simply come close—in the seven Southern states with Democratic contests on Tuesday, she’s in for a big night. Polls currently show her with massive leads in Alabama (38 points), Georgia (35 points), Arkansas (29 points), Texas (28 points), Tennessee (26 points), and Virginia (20 points). She also holds slim leads in Oklahoma (4 points), which remains high on Sanders’ wish list, and Massachusetts (2 points), where a Clinton victory would take a lot of the luster off Sanders’ New Hampshire win last month. Bernie should coast to an easy win in his home state of Vermont on Tuesday, so he’s not in danger of a complete shutout. Still, Tuesday is looking anything but super for the self-styled democratic socialist. If Hillary performs as expected, Bernie’s already narrow path to the nomination will become pretty impossible to see. Like the GOP’s Super Tuesday contests, none of the Democratic ones are winner-take-all affairs. Unlike the Republican race, though, every other Democratic contest remaining on the calendar will also hand out delegates proportionally. That makes mounting a comeback considerably more difficult for a candidate who falls behind early. Given Clinton’s massive advantage with superdelegates, Sanders could wake up Wednesday knowing that he’ll need to win close to 60 percent of the remaining delegates. That’s a heavy lift. Sanders’ best-case scenario is that he wins tonight in Vermont, as well as in Massachusetts, Oklahoma, Colorado, and Minnesota, the only four states he’s been spending any real money in. If he also can limit his losses in the South, it’s conceivable, though unlikely, that he could earn roughly the same number of pledged delegates as Clinton. His more realistic hope is that he wins Vermont and splits the other four states he’s targeting with Clinton, limiting the damage ahead of this week’s other contests—Kansas, Nebraska, and Louisiana on Saturday, and Maine on Sunday—most of which have electorates that look more like New Hampshire and Iowa than they do Alabama and Texas. That would prolong Sanders supporters’ dreams of a historic upset, but it still wouldn’t be enough to make them come true.